I'm putting it down to the beautiful sunny weather we've been experiencing over the past few days. Yes, it's always the sunshine that triggers them. Memories. Happy childhood recollections from a time when playing games didn't involve sitting at a computer monitor. No, these games were purely physical in nature. Skipping, playing ball against your house wall (one, two, three o leary! ), beds (nearly every street had the chalk markings where you hopped from number one to number eight kicking an old polish tin, Nugget, I think the makers were, which you'd filled up with gravel to give it some weight), chasing, oh! the list goes on and on! All of that along with walking to and from school every day definitely meant you got all the physical exercise you ever needed. Above is my avenue where my pals and I played all of the above games. Taken by me in 1969. You might also notice from the above image that not many of my neighbours had cars. Only the families where the husband had any kind of a good job were the ones privileged to own such luxuries and some of these people even had a telephone installed in their hallways! We had neither car nor phone but what you didn't have you didn't miss. One of my nicest memories of my summer childhood was when I'd be watching out for my Dad to arrive home on his bike just after mid-day for his dinner, yes, back then we had dinner in the middle of the day and tea at between five and six o'clock. 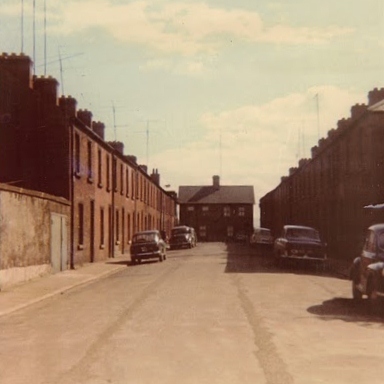 While I'd be waiting for him the bread man, driving a Kennedy's electric van, would hover up the avenue to deliver his freshly baked loaves and pans but not to our house. We only got white bread from him on a Saturday as a treat because during the rest of the week my mother baked her own brown bread. Being a country woman my mother only approved of white bread being eaten in small amounts. What she didn't know was that sometimes my friends, when they'd go in for something to eat, would bring me out a jam sandwich or nicer still, a mashed banana and sugar sambo. I can still feel and hear the sugar crunching between my teeth! Sadly my molars' sorry state still bear testiment to those moments of Heaven. Another treasured memory is again during the summer months when the monotonous sound of the dredger cleaning the bottom of the sea (my avenue faced onto the sea wall) and the subsequent cry of the overhead gulls looking for food would take me into a very relaxed state of mind, it was almost hypnotic. I still long for that sound. Those were moments I usually enjoyed by myself without the constant distraction of conversation. 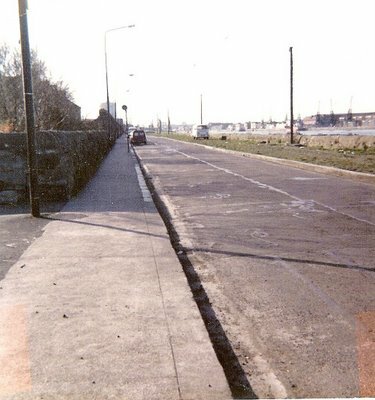 (You can view some of my Ringsend photos on: My Flickr Photostream) As a kid I was very aware of the sounds around me e.g. traffic in the distance (thin on the ground in those days), again the cry of the gulls first thing in the morning and on a winter's night the fog horn, its eerie signal guiding the ships home through a dense sea fog. Above was the view from the end of my avenue. Taken by me in March, 1981. It was wonderful living so close to the sea and of course we also had Sandymount strand on the other side, sure we were blessed! My dream is to retire back there some day. Some of the sounds may have long since been silenced but it's still a magic place no matter. This is certainly a nostalgia picture worth remembering.